Santa Clara, CA - A recent survey of Linux users found that the two main factors in their migration to Linux was its stability and that it made them feel intellectually superior. Developers promise that along with USB support there will be increased intellectual superiority in the upcoming 2.4 kernel release AKA the "Hubris" kernels. "Many users complained that in our previous release that we sacrificed some intellectual superiority in the name of 'ease of use'. We aren't going to make that mistake in this release," said kernel programmer Johan Klens. "Programmers have worked very hard in the latest kernel release trying to make even simple tasks more difficult," continued Mr. Klens, "This release is going to include the "ocsh" - the obfuscated C shell, sure to be a favorite of intellectual superiors. In addition to inputting commands as obfuscated C code, users can also input commands in binary directly to the registers. It took me 10 minutes to code the directions to 'cat' using ocsh, but it was worth it!" 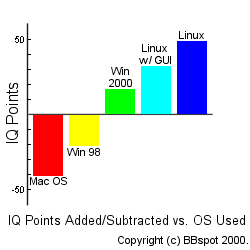 "I was impressed by the stability of Linux," said Thomas Azizi "and since I'm a loser in pretty much every other facet of my life, gloating about my OS choice makes me feel great." "Let's face it. Linux isn't for dummies," said Linux advocate Dieter Braun, "There may have been a Linux for Dummies book, but I doubt it sold a single copy. I'm sure Windows for Dummies was a best seller." the cd has some problem with it , its getting stuck . Work around - partition using the applicaion in the live cd called 'gpart'. installed the system after a week long exercise. There's nothing inside ,No music players ... not even a 'gcc'. everything must be downloaded. Need to install java - how? Sorry nothing there remotely connected to java. I downloaded and installed everything that began with java... , no use . (i was looking for javac - java compiler). Began searching for "ubuntu 6.06 - install java" most of them were .deb files. absolutely no use ,full kachara , kept on searching - found this out but it cost me a 100Mbs worth download but voila java is home. On Debian/Ubuntu Linux for example all you need to do is make sure that your apt-get is pointed at the right place. In your /etc/apt/sources.list add in the following (and make sure you are okay with adding in stuff that is not in the default environment). After this the rest of the process will display a dialog that will require you to accept the license agreement. When you do, the rest of the setup will happen on its own. You should be good to go! Finally we have an easy way to install Java on the various Linux variants without having to fight with fakeroot and the other foolishness. Took Sun a criminally long time to do this, but I (not me - i have reasons to think otherwise) certainly thank them for it. How i still cant make up my mind on which linux to use since i have already installed and uninstalled 5 of them. How we succeed after so many trial and errors and eventually get better. How the most trivial things matter most and important things trivial at times. is it that people so much time over orkut? is it that people spent so much time online , pursuing worthless activities? is it that i am so keen on writing these silly things? i am sarath a.This blog enlists motivational or inspirational works. GO For Maximum mischief.